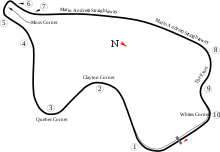 The 1971 Canadian Grand Prix was a Formula One motor race held at Mosport Park on September 19, 1971. It was race 10 of 11 in both the 1971 World Championship of Drivers and the 1971 International Cup for Formula One Manufacturers. Jackie Stewart took the win in the awful conditions and the race was stopped after 64 laps due to the weather. American Mark Donohue scored an excellent third on his F1 debut. This was the first ever Formula One race to be red flagged. ^ "Weather information for the "1971 Canadian Grand Prix"". The Old Farmers' Almanac. Retrieved 2015-05-20. ^ "5. Red Flag!". formula1alltheraces.com. Retrieved 20 April 2019. ^ "1971 Canadian Grand Prix". formula1.com. Archived from the original on 17 October 2013. Retrieved 22 December 2015. ^ "Grand Prix Results: Canadian GP, 1971". grandprix.com. Retrieved 2017-12-05. ^ a b "Canada 1971 - Championship • STATS F1". www.statsf1.com. Retrieved 14 March 2019.